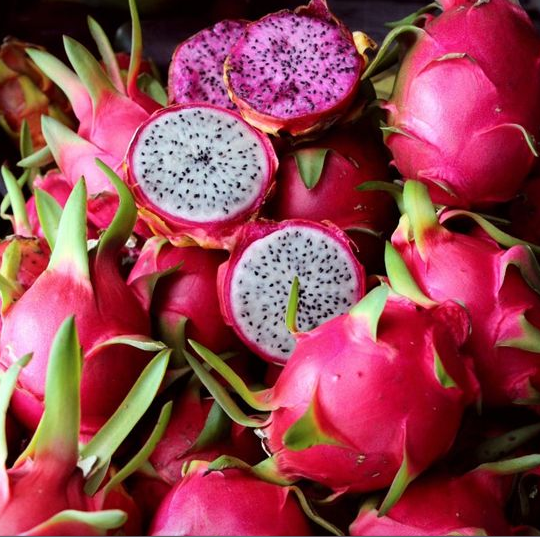 Living in the tropics sure has it perks, the beach of course, but today’s focus is the exotic tropical fruit, pitaya or dragon fruit. 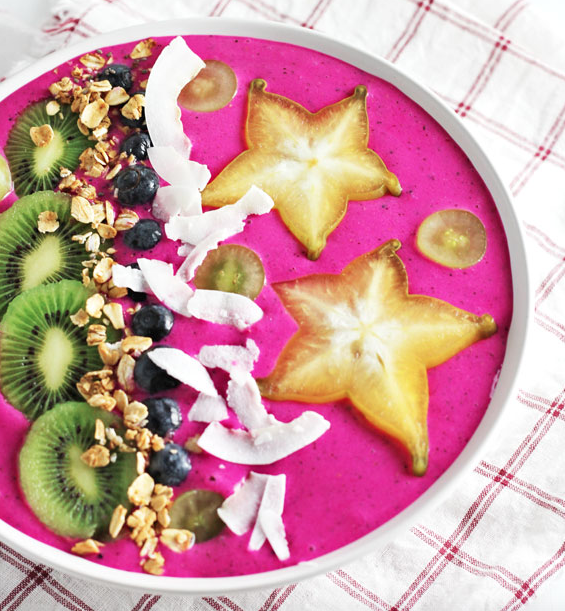 No knight in shining armor needed here, you can slay this dragon fruit in your own home and create a beautiful smoothie bowl yourself. Imagine kick-starting your day with a meal as colorful as the rainbow, and we aren’t talking about skittles! You know you are getting a daily dose of nutrients when your breakfast looks like this! Dragon fruit is high in vitamin c, fiber, calcium and antioxidants. Helping with weight management, improving cardiovascular health and regulating blood sugar levels are among some of the health benefits this incredible fruit has to offer. Besides the health benefits, it is delicious and quite pleasing to the eye! Here’s how you slay the dragon… This vibrant bowl is quite simple to make. If you have fresh dragon fruit, slice the fruit in half lengthways and scoop out the inner flesh. The seeds are edible similar to a kiwi fruit. You can also slice the dragon fruit and peel off the skin. If you can’t find fresh dragon fruit, look in the frozen section. Both frozen or fresh fruit will work! I prefer to cut up my fruit the night before and place it in tupperware so it is ready to go in the morning. Blend the dragon fruit, banana, yogurt and pineapple in the blender. The consistency should be a little thicker than a smoothie. Finish off your masterpiece with toppings such a coconut, granola, berries, kiwi, star fruit and cacao nibs. Get crazy and put on whatever you like! I hope your day is as bright as this bowl!